Rajasthan has many great cities to tour into. Jaipur is the main city which connects to rest of the country. You may choose from the wide variety of Best Tour Packages In Jaipur which lasts from 2 days to the number of days you would like it to last. These Tour Packages have almost all sorts of options to choose from. You can visit the historical places in Jaipur and around it as well. We get many Indian and Foreign tourists each year who visit the city for its cultural heritage value. We have the privilege of planning the Best Tour Packages In Jaipur for them. These Tour Packages In Jaipur can be corporate, pilgrim, adventure, honeymoon, leisure and almost all kinds that is on your mind. We have the experience to serve almost all guests from around the world and do get a positive and overwhelming response and feedback from them. We not only provide jaipur Tour Packages but also Rajsthan Tour Packages as well. These packages are from Jaipur and can be arranged from any other part of Rajasthan as well. The package includes almost all the things such as food, accommodation, sightseeing, and much more in Rajasthan Tour Packages. At GalaxyTour001 you will find the Best Tour Planner in Jaipur who can plan your holidays as per your requirements. The stay is in some of the best hotels as per your requirements and the travel is from ac coaches or car rentals depending on the number of guests. We ensure that your requirements are on top priority and give you a complete luxurious experience. If you have been busy to book a tour package in advance we would help you book one on an immediate basis. So, wait no more and book a Best Tour Packages In Jaipur now. We have long experience in providing great variety of Rajasthan Tour Planner in Jaipur ranging from 3 days to 21 days which include old age history of Jaipur, Shekhawati region, Ranakpur, Fatehpur Sikri, Jaisalmer, Jodhpur, Udaipur, Ajmer, Pushkar, Mandawa, Bikaner, Fatehpur, Chittorgarh, Bundi, Sariska, Agra, Mount Abu, Ranthambore, Sikandra, New Delhi, Sawai Madhopur, Bharatpur. These cities have many places to visit and every year millions of Indian and Foreign tourist visit these cities and We are Best rated Travel Agency in Jaipur for providing great variety of tour packages like Honeymoon Tour Packages, Golden Triangle Packages, Adventure tour packages, pilgrimage tour packages, corporate tour packages, Safari tour Packages etc. these are created by our experts as per traveler/Guest requirement. We are continuously receiving good and positive feedbacks from our clients and guests for the services provided to them. As a Best Tour Planner In Jaipur We are serving guests from all over the world by providing Best Tour Packages In Jaipur. Rajasthan, known formerly by the name Rajputana or the land of the kings, is the largest state in the republic of India. It covers an area of 342,239 sq kilometers which is 10.4% of India. However despite of its large size it is covered by the Great Indian Desert, Thar. The Thar Desert runs parallel to the Sutlej-Indus river valley. Being located at the forefront of Indian civilization, the state of Rajasthan has seen the age of kings thus, explaining the moniker ‘the land of kings’. Rajasthan houses an amazing display of arts and architecture, courtesy of it being a princely state. Each individual kingdom of Rajasthan has a distinctive style of architecture and arts making it one of the most culturally diverse places in the world. That's why Rajasthan Tour Package is best tour in India. In this article we shall list out the 10 popular places to visit in Rajasthan. Famous for: Heritage, Forts, Shopping, Cuisine. Major Attractions: City Palace, Amer Fort, Pink City Bazaars. Nearby Places: Ajmer, Sawai Madhopur, Pushkar. Ideal Visit Time: 2 days or more. Places to Visit : The capital of the state, Jaipur is also the largest city in the princely state of Rajasthan. It was founded in 1727, by the Kachwaha Rajput Ruler Sawai Jaisingh II, who was the ruler of Amber. Also known by the nickname ‘Pink City of India’ which is due to the distinctive saffron or pink color of the buildings. The planning of the city was done according to the Vedic Vastu Shastra (Indian architecture). The well planned streets and detailed and artistic architecture make it one of the top preferred tourist locations. In the 2008 Conde Nast Traveller Readers Choice Survey, Jaipur was ranked #7 of the best places to visit in Asia. Jaipur has lots to offer to even the most average tourists. Forts, monuments, temples, Gardens, museums and vast market places of Jaipur bring tourists who come from all around the world to experience the food, fun and frolic at this wonderful town. Jaipur is also home to a huge no. of arts and craft with over 20 unique specializations. To learn more about the tourist places in Jaipur, please visit: places to visit in Jaipur. You might want to plan a separate 3 day itinerary for this city alone.Jaipur is also an ideal destination because of its proximity to many other tourist destinations. Samode, Dundlod, Jhunjhunu, Deeg, Alwar, Dausa, Shekhawati, Mandawa, Bharatpur, Bhangarh, Abhaneri, Sariska National Park and Neemrana. These destinations will take less than a day’s journey via road. Famous for: Heritage, Forts, Lakes, Weddings. Major Attractions: City Palace, Lake Pichola, Lake Palace. Nearby Places: Nathdwara, Kumbhalgarh, Mount Abu. While in a few texts, it has been termed as the Venice of the East, the City of Udaipur is known by its common moniker, the city of lakes. The city was the capital of the Sisodiya Rajputs of Mewar and is famous for its palaces that exemplify the finesse of Rajputana Style architecture. Udaipur was founded in 1553 by the Sisodiya Rajput Ruler Maharana Udai Singh II. The Mewar Rajputs founded the city to relocate their capital from Chittor to a more secure location. Today, most of the palaces have been converted into hotels, thus attracting a huge no. of tourist crowd to this city. The city’s picturesque location at the foothills of the Aravalli Mountains, the state of Udaipur is a unique destination. Apart from its various palaces, forts, market places, and various temples are also the reason for its popularity. The cities are well planned and the people hospitable, the place is not only famous for its palaces and monuments, the city of Udaipur has a lot to offer its visitors. To learn more about the popular tourist places in Udaipur, please visit: places to visit in Udaipur. Some of the attractions nearby Udaipur city are Dungarpur, Ghanerao, Banswara, Dungarpur, Rajsamand, Nathdwara, Haldighati, Ranakpur, Kumbhalgarh and Mount Abu. These places will take a day’s time to visit. Famous for: Heritage, Forts, Cuisine. Major Attractions: Mehrangarh Fort, Umaid Bhawan. Nearby Places: Osian, Phalodi, Ranakpur. The second largest City of Rajasthan, Jodhpur is also the second most populated city of Rajasthan after Jaipur. The city was founded in 1459 by the Rathore Rajput Ruler, Rao Jodha Singh of Marwar. The city was founded as Marwar’s new capital after the fall of the former capital of Mandore. Jodhpur is also called the Sun City as it enjoys a bright sunny weather all year round. Strategically, it is considered to be the most important city of western Rajasthan as it lies only at a distance of 250 kilometers from the Indo-Pakistan border. Also, because it lies in the center of Rajasthan, Jodhpur is an important tourist destination as well. Jodhpur has been listed many a times in various tourism magazines and documentaries and has topped the lonely planet’s list of most extraordinary place to stay in 2014. The various hill forts, palaces and the old walled city are just a handful of attractions from the multitude that this wonderful city has to offer. To learn more about the famous tourist places in Jodhpur, please visit: places to visit in Jodhpur. Other places nearby Jodhpur are Khimsar, Pali, Nagaur, Ranakpur, Osian and Phalodi. These places are a must visit and would take less than a day’s time to explore. Famous for: Heritage, Thar Desert, Havelis. 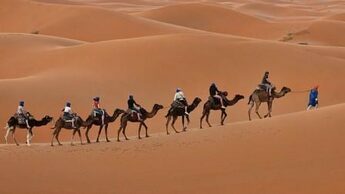 Major Attractions: Jaisalmer Fort, Sam Sand Dunes. The aptly named 'golden city', which comes from its view during the day, the city of Jaisalmer lies in the heart of the Thar Desert. The city was founded by The Bhati Rajput ruler Maharawal Jaisal Singh in 1156 Ad and it gets its name from the golden sands of the Thar Desert and the same golden colored sandstone used in the city’s architecture. This is a famous tourist spot due to its magnificent architecture and the various arts and crafts which are unique to this region. It thrives on tourism, and can be called a home away from home for a huge no. of tourists from all around the world. The unique feature about the city of Jaisalmer is its architecture. It was built as a walled city which makes it one of the largest forts in the world. You might want to pack a lot of paperbacks and almost 3-4 days to enjoy the life in this city to its fullest. The fort has numerous eateries that offer Italian, French and local cuisines. Visit during the months of November and December and you will enjoy this castle city to its fullest. To know more about the main tourist spots in Jaisalmer, please visit: places to visit in Jaisalmer. Other noteworthy places near Jaisalmer that would richen the your experience are Kuldhara, Khuri, Lodhruva and Barmer. Famous for: Heritage, Cuisine, Rat Temple. Major Attractions: Junagarh Fort, Karni Mata Temple. Nearby Places: Churu, Salasar, Nagaur. Ideal Visit Time: Half to 1 day. The city of Bikaner was founded in 1488 by the Rathore Rajput Ruler Rao Bika. Rao Bika was the son of the Rathore Ruler Rao Jodha who founded Jodhpur. The land was usurped from the rivaling Jat rulers of that time. However, no matter how many wars the ancient city has seen in the past, today Bikaner is another prime tourist destination and is famous for its sweets and snacks. The place is known for its forts and food. The various arts and crafts of this place are also unique, especially the intricately carved windowpanes called jharokhas. It is one town we would personally recommend for you to visit if you want to experience the authentic taste of rajasthani cuisines. The various fairs held in Bikaner also attract a huge no. of visitors from all around India and the world. Junagarh Fort Lalgarh Palace. National Research Centre on Camel. Shri Laxminath Temple. Ganga Singh Museum. Sadul Singh Museum. To know more about the main tourist destinations in Bikaner, please visit: places to visit in Bikaner. Some other places that are a must visit are Deshnoke, Nagaur, Khimsar, Salasar and Churu. These places would take a day’s journey to visit and would surely add to your memories. Famous for: Lord Brahma, Hinduism, Camel Safari. 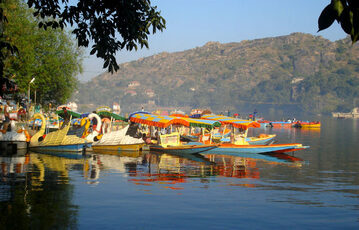 Major Attractions: Pushkar Lake, Brahma Temple. Ideal Visit Time: Half day. Lying in the Ajmer District of Rajasthan, the holy City of Pushkar is often described as the king of pilgrimage sites in India. The town is located at the shores of the Pushkar Lake, which was created by the tears of Lord Shiva and is one of the oldest cities of India and the date of its origin is unknown and is often associated with the Hindu mythology. It is famous for its temples and various Ghats which are frequented by hundreds of visitors during the annual bath. The water of the lake is considered sacred and thus is responsible for the town’s repute as a pilgrimage spot. Perhaps the most illustrious attraction of Pushkar is the annual camel fair. It is a five day fair held where people buy and sell livestock. But that’s not all; the fair is home to a large no. of tourist crowd that is attracted by the music, dance and various events that are held here during the camel fair. Camel races are one of the major attractions as well. Pushkar Lake. Brahma Temple. Savitri temple. Apteshwar Temple. Varaha Temple. Rangji temple. To learn more about tourist places in Pushkar, visit: Places to visit in Pushkar. Some other attractions nearby are Bundi and Ajmer. Major Attractions: Ranthambore National Park, Ranthambore Fort. Ideal Visit Time: 1 day or less. Sawai Madhopur was built by Maharaja Sawai Madho Singh of The Kachwaha Rajputs and was founded in 1763. While the town itself doesn’t have any notable tourist attractions, just two attractions have made this city a must visit place in Rajasthan. They are the Ranthambore Fort and the Ranthambore National park. The Ranthambore forests were the hunting grounds for the Kachwaha Rajputs of Jaipur till the time India received its independence. After independence it was established as the Sawai Madhopur Game Sanctuary and it rose to being a tiger reserve in 1973 and got its national park status in 1980. One should also visit the Ranthambore fort, which is a part of the UNESCO world heritage site. The fort is situated in the forests of the Ranthambore National Park. The construction of the fort predates the reign of the Kachwaha Rajput Clan and was founded by the Nagil Jat Ruler Raja Sajraj Veer Singh Nagil in 944 AD. The fort housed many different ruling clans till it finally fell to the Kachwaha Rajputs of Jaipur. The vast cultural history imbibed in this ancient architecture is a must visit indeed. Ranthambore National Park. Chamatkar Temple. Chauth Mata Temple. For other tourist attractions, please visit: tourist places to visit in Ranthambore. Famous for: History, Heritage, Forts. Major Attractions: Chittorgarh Fort, Rani Padmini Palace. The ancient city of Chittorgarh also known as Chittor, was said to have been founded by the Maurya Dynasty. However its significance rose when the Ruler of the Sisodiya Rajput Clan of Mewar captured the city in 734 Ad and made it the capital of Mewar. The place is known to be the birthplace of many great warriors and historical figures like the Great Maharana Pratap and the Hindu saint, Meera Bai. The city being an ancient place contains many different palaces, temples and forts which display some of the most advanced architectural designs and artistic mastery. is the Chittorgarh fort, which is the largest fort in India. The fort was the former capital of mewar before its relocation to the more secure city of Udaipur. The fort was founded in the 7th century by the 1st Sisodiya Rajput Ruler Bappa Rawal and spreads over an area of 2.8 sq kilometers and its highest elevation point is 1,075 meters above sea level. Upon visiting you will experience and witness the Rajput style architecture at its best. The fort complex itself contains several palaces, gardens and temples most of which have a great historical significance. Chittorgarh Fort. Rana Kumbha Palace. 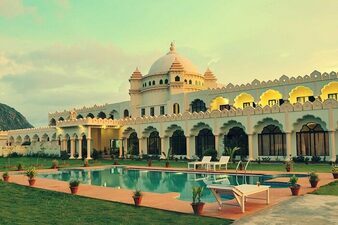 Fateh Prakash Palace. Meera Temple. Rani Padmini Palace. To know more about these places, please visit major places to visit in Chittorgarh. Other nearby places of interest nearby are Kota, Jhalawar, Bhilwara and Ranakpur. These places are sure to astound you and won’t take more than a day’s time to explore. Famous for: Hill station, Nature, Jain Temples. Major Attractions: Dilwara Jain Temple, Nakki Lake. The place takes pride of it being the only hill station in the desert state of Rajasthan. Mount Abu is situated in the Aravalli mountain range and is a part of the Sirohi District of Rajasthan. The place apart from being a retreat for the people of Rajasthan and Gujarat from the scorching sun but has a lot of historical and religious significance. Mount Abu was known as the Arbuda Mountain, which has been mentioned in the Hindu Epic Mahabharata and is known to be the place where the Great Sage Vasistha retired. The hill station houses many ancient sites and temples which are frequented by many pilgrims from across India along with many forts and lakes. The place is a heavenly retreat for the sun scorched people of Rajasthan, with its lush green surroundings and various picnic spots. Dilwara Jain temples. Guru Shikar. Achalgarh. Nakki Lake. Sunset Point. Achaleshwar Mahadev Temple. Trevor’s tank. Mount Abu Bazaars. Wildlife Sanctuary. To know more about the main tourist destinations in Mount Abu, please visit: places to visit in Mount Abu. Major Attraction: Ajmer Sharif Dargah. Ideal Visit Time: upto 6 hours. Ajmer is surrounded by Aravalli ranges and is a city seeped in both history and culture. It lies near Pushkar, a major Hindu pilgrimage site and is the home of the shrine of Khwaja Moinuddin Chishti. This makes it a unique pilgrimage site for both Hindus and Muslims. Apart from being a pilgrimage site, it is also the home of many fascinating historic sites and therefore welcomes tourists from all over the world. In 2015, Ajmer was selected as a heritage site for the HRIDAY - Heritage City Development and Augmentation Yojana scheme of Government of India. Ajmer Sharif Dargah. Taragarh Fort. Adhai Din Ka Jhonpra. Abkari Fort and Museum. Anasagar Lake. Soniji ki Nasiyan. To know more about the main tourist destinations in Ajmer, please visit: Places to Visit in Ajmer. Other attractions nearby are Pushkar and Bundi. A visit to these places would take less than a day’s time. Rajasthan, the land of kings and forts, with its rich cultural history will have a different flavor with every single place you visit. The aforementioned places unfold just a handful of the many secrets this ancient kingdom hides. A visit to tourist places in Rajasthan is one of the most spiritual experiences you will ever witness and is sure to captivate your mind the moment you land here. Mobile Number with Country code and Email address separated by comma.